This level has medium difficulty. For this level try to play from where more candies are available to play and make special candy. Combine special candies with each other to break more chocolates. Or play near to chocolates to break them without wasting moves. 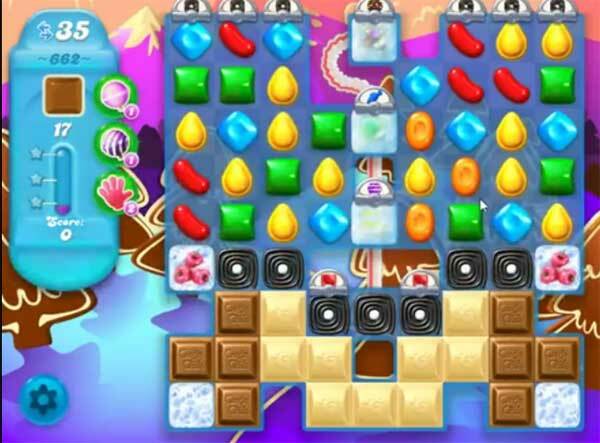 This level is impossible…I have not even come close to passing this level, the chocolate eats all my special candies. Not fun just annoying. I have never been lucky enough to have any of those combinations dropped to me! Way too difficult. Not fun any more. I can’t beat this level either. Tried for months. Deleted the game for over a year & tried again. Still can’t do it. No fun at all. Deleting the game again. I don’t understand why brown and white chocolate keeps growing even when you knock some out. I thought once you knocked one or more out, none would grow until the next hit.